Hi friends! I hope you are having a great week! We are getting by. Brady told me this morning "I'm still so sick!" We are staying in the house and I have to tell you, I'm going a little stir crazy. Here's a card I made for a call that was rejected. Poor little robot! The robot stamp is from October Afternoon. I couldn't resist this cute stamp set. So perfect for my cute little boys! I paired the robot with a sentiment from Lawn Fawn's Just My Type Too! The paper is from My Mind's Eye Lime Twist Out of the Blue. And the baker's twine is Divine Twine in Blueberry. this is a great masculine card! 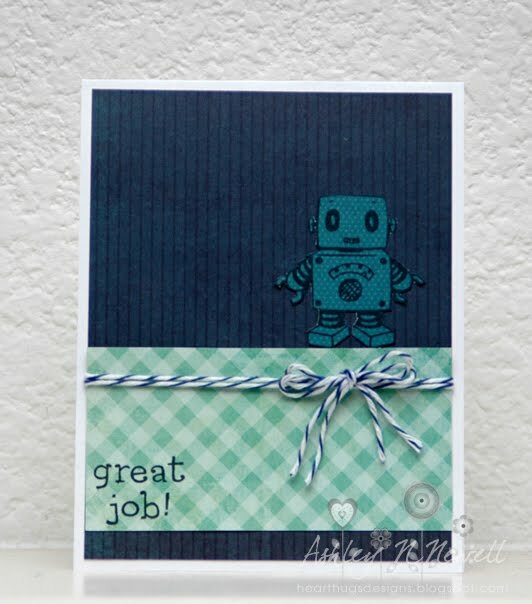 very cute, love the little robot! Super masculine card and great CAS design! That robot is so sweet! This is TOO adorable!! I love it! !